Bengal Business Summit 2019: Of those ministers invited, only Suresh Prabhu has, according to sources, written back expressing his inability to attend. Bengal Business Summit: Mamata Banerjee hosted diplomats and business leaders in Kolkata. 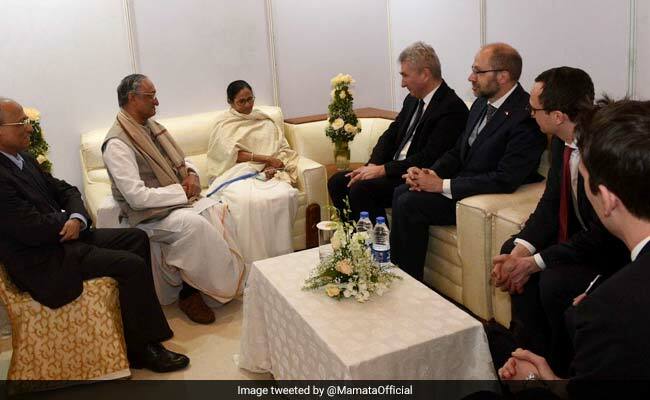 24 hours after she ended her sit-in in Kolkata's Dharamtala, West Bengal Chief Minster Mamata Banerjee played host to dozens of diplomats and business bigwigs ahead of the Bengal Global Business Summit that begins today. Among those expected to attend is Mukesh Ambani. Niranjan Hiranandani of the Hiranandani group and Rajan Bharti Mittal of the Bharti group are already in Kolkata and many more business leaders including the south Asia head of Coca Cola are expected to be at the venue at Kolkata's New Town for the fifth edition of the two day summit. The West Bengal government had also sent out invitations to the summit to several Union Ministers. In the past, among the most prominent central representatives were Arun Jaitley Suresh Prabhu and Nitin Gadkari. But this time, given the recent fierce political face-off between leaders of the BJP and the ruling Trinamool Congress, no central minister is expected. Of those invited, only Union Commerce and Civil Aviation Minister Suresh Prabhu has, according to sources, written back expressing his inability to attend. But after taking on the centre in the most unprecedented manner over the so-called unconstitutional attempt to harass the Kolkata police chief by the CBI, it is unlikely that Ms Banerjee was expecting anyone from the BJP to share the dais with her. Next week, Ms Banerjee is taking her battle against the BJP's alleged attack on democratic institutions to New Delhi where she is likely to be joined by other opposition leaders in a dharna on February 13 and 14. In the past, the Bengal Global Business Summit has drawn much attention. From 20 countries in 2015, the number of overseas participation has grown to 35 this time. Among the participating countries are the UK, France, Czech Republic and South Korea. But given that it is election year, the focus at this summit is likely to be the mood of the investors and about Ms Banerjee, especially as the event comes just 48 hours after the stormy face-off with the BJP at the centre.